We could not be happier with our decision to work with Siri! Her photos are classic and timeless, and she was a joy to work with--calm, relaxed, down-to-earth, always there when you needed her but never intrusive. When we got our photos, we were literally speechless. They made us laugh, they made us cry, and they told a million stories. She perfectly captured how that day felt, and so much more. We can’t wait to look at them again and again, and treasure them for a lifetime. She was everything we could have asked for, and I cannot recommend her highly enough. We had a wonderful experience using Siri as our wedding photographer. From the first time I met her I knew she would fit us perfectly as she was very down to earth and not overbearing like several other photographers I had spoken with. The day of she caught so many moments that we were not able to witness and it gave us such wonderful memories to share with our guests. I would highly recommend her to anyone, thank you Siri, we love your work! Siri was wonderful to work with. She came highly recommended from a photographer friend who said that if she were to get married, Siri was the person she would want as her photographer (can't get a better recommendation than that!). Siri was responsive, enthusiastic, and genuine. On the day, she blended in seamlessly and also spotted good photo opportunities. The photos that we have show both the joy of the day and the unique spirits of our friends and family - there are so many wonderful photos, multiple people have reached out since the wedding to ask for copies of a particular photo or for Siri's information. She captured so many moments that we, caught up in the emotion of the moment, could not have recorded - and we are thankful to have many amazing photos to treasure for years to come. Great to work with: great results! My (now) Husband and I used Siri for our wedding. She was invaluable both the day of the wedding as well as in preparation. Siri made both of us feel at ease and worked to capture our unconventional wedding day. More importantly, Siri has a great eye and captures the light beautifully while keeping it candid and fun! Worth noting: the payment and invoicing process is very easy and up to date. I was able to do everything on the road with convenient reminders built in. Siri Jones is a timeless and high-quality photographer that you won't regret booking! Her skill in documenting weddings in a photo-journalistic style really brings the heart and soul of weddings to life. After booking her for my October 2017 wedding almost two years ago, I was ecstatic watching her post updates from other weddings. Each one showed off the distinct personality of each couple and their wedding in an artistic and beautiful way. I felt even more pleased with our own wedding photos which we got a couple of weeks ago. My husband and I cannot stop looking at them because they truly capture the story of our big day. Beyond Siri's work, she is a wonderful person! She is easy-going and fun, while also being professional and responsive. Her organization makes the tedious aspects that come with booking wedding vendors seem breezy. I highly recommend Siri for both engagement and wedding photos! Siri is a dream of a wedding photographer. She's extremely organized and was very responsive leading up to and after my wedding. If you're having your wedding outdoors, stop reading this review and hire her. Her combination of documentary-style photography, ability to capture the beauty of nature and light, and strong eye for composition are a winning trifecta. Her photography captures the wide range of emotions of the day as well: from joy to those quieter blissful moments expressed through a glance or entwined hands. And her personality is wonderful- believe it or not, this counts for a lot on your wedding day too! Siri photographed our wedding at the Charles River Museum in Waltham this year. Working with Siri was a fantastic experience, and we felt she went above and beyond to give us beautiful pictures. She captured so many emotions that I didn't see or didn't remember, and every time I look at our pictures I can really feel the range of emotions that everyone had that day. Amazingly, Siri took so many of these pictures without making her presence known, which in retrospect is something that I really appreciated. 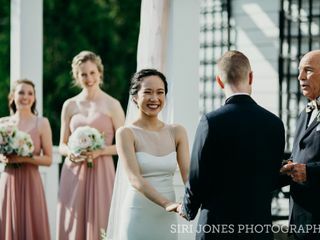 I have been at so many weddings where the photographers get in the way at the ceremony or on the dance floor, but Siri totally let us do our thing and let our guests have an unencumbered experience. She was a super calm presence, especially right before the wedding when we were a little jittery, and that was perfect. We really appreciated how flexible and relaxed she was! Also, we loved that she gave a little preview of the pictures to come on Instagram before we got the whole package. Overall, I could not recommend Siri more. Siri was amazing to work with. She captured each moment perfectly, and I couldn't be happier with the results. She blended into the crowd so well and caught each memorable moment. Our portraits are gorgeous and incredible, and the candids she caught really bring back the memories of the night each time we look at them. She was so sweet and flexible, and worked great with me and my husband's quirky personalities as well. Highly, highly recommend! I cannot say enough wonderful things about Siri and the images she captured from our wedding. Leading up to the wedding she was valuable with advice for timing her arrival and how much we would need for each stage of the day (getting ready, first look, portraits etc.) At the wedding she was calm, professional, and unobtrusive. When taking portraits or working through curveballs, Siri was kind, helpful, instructive, and comfortable. When taking candid photos she blended into the crowd. She worked quickly and efficiently through the day. It's been just over a month since our wedding and I've already recommended her to anyone who will listen. As for the photos, they are perfect. She captured all the portraits and specifics we asked for and so, so much more. Of the photos she took, our favorites weren't the ones we asked for but the moments she captured and you couldn't orchestrate. Looking through the gallery, you don't just see the wedding day you feel it. Siri has such a beautiful energy and a truly discerning eye for capturing beautiful moments and the overall essence of our wedding. We loved that the photos were not over-stylized and were able to capture events as they unfolded in their natural and beautiful state. If any part of you wedding is outdoors, she is the absolute best to hire, she has the best eye for nature. Every single guest has commented to me that my photographer was so amazing and truly talented. It was so nice to hear that my guests loved the photographer and her photos. There are not enough great things I can say about Siri! She was kind, helpful, and her eye was amazing. She captured a ton of magical moments and once we got to see our photos we were speechless. We're able to relive our day, with all these little details that we missed while being present in the entire day. She was quick to get our photos back, she was quick to respond to any question we had and did a great job of capturing the joy + love between us. She also worked with some of the restrictions of our venue - Old North Church - and you would've never known that she was limited in where she could shoot photos. I am so glad we found her and I'd recommend her to anyone looking for a photographer for their wedding. Thanks Siri! We picked Siri as our wedding photographer because she not only captures moments beautifully, but each of her images is a work of art. I was incredibly impressed with her ability to blend in to the crowd. There were many times that I was having a special conversation with a friend or family member, and then I'd see a flash of her capturing the moment. She painted a picture of the wedding so authentically, and I'm so glad that we have these images to help relive the day. Using Siri was one of the best decisions we made in planning our wedding. She was easy to work with and we couldn't have been happier with her photography. She managed to capture every important moment, as well as people reacting to those moments. Thank you Siri! Siri was a dream to work with! I knew after our "meet and greet" that she would capture our sense of adventure, and the unique qualities of our wedding. She was very flexible with her time and was a pleasure to work with on the day of the wedding. I enjoyed our experience so much that I recommended her to a friend, and my friend hired her to capture her own wedding! Siri is great! She is a awesome photographer who makes you feel at ease. We loved our pictures, Siri helped make it fun and comfortable to take them, so nothing felt forced! Thank you so much Siri, you were great! 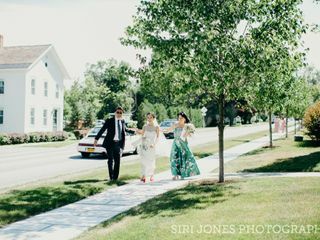 We highly recommend Siri Jones Photography! We were drawn to her beautiful, documentary style photos and the fact that she takes lots of candid shots not only of the bride and groom, but the wedding guests and entire day. We felt comfortable with her as soon as we met her, were at complete peace once we booked her, and were so glad to have her as a calming presence on our wedding day. Her customer service really set her apart as well - she's very responsive and helpful, and sent us a sweet gift along with our photos. We were so happy with our engagement and wedding photos, and felt like they truly captured the whole day. Siri was so great to work with and a talented artist! Siri was completely fantastic and we feel SO lucky to have had her be a part of our wedding. She made us feel comfortable immediately and really got (and dug) the feeling we were going for. Siri was very easy to work with logistically, helped us set up a package that suited our needs and budget, and was quietly professional and calming on the actual day of our wedding -- she got every shot we asked for and a ton we didn't know we wanted, and managed to bring an energy that helped me take moments out to be present and feel emotion and have fun! even in the midst of the chaos of the day. And, of course, we ADORE the pictures, which are gorgeous almost beyond belief. Overall, it was a wonderful experience and highly recommended! Siri was a pleasure to work with. 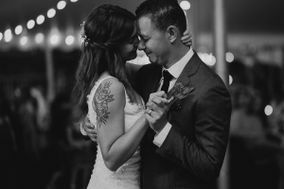 Extremely reliable, and very personable - and to top it off, we are OBSESSED with our wedding photos. As a couple that was nervous about having "all eyes" on us, Siri helped us become more comfortable around the camera. She was assertive when necessary, but what I appreciated most was her ability to melt right into the background and discretely captured those precious moments that we will now be able to cherish for the rest of our lives, thanks to Siri! Siri was a joy to work with and is incredibly talented. Very grateful to have her with us on our wedding day! Where do I begin? From the minute I contacted Siri she was so kind and flexible. I loved her work and was elated when she was able to work with my budget. I am so happy with every single beautiful moment she captured. Even when the best man made a very drunk and embarrassing speech ( which I'm pretty sure I made some of the ugliest faces EVER!) She was able to find a few where I was smiling - I'm still not sure how she did it! I recommend her highly and can't wait to work with her again! Thank you so much, Siri! We are so glad we chose Siri Jones photography for our wedding. I contacted Siri after seeing a friend’s beautiful wedding photos that Siri had created. Siri is professional, personable, and extremely talented. She helped me create a wedding package that suited our needs, and I knew exactly what I could expect from her on our wedding day. She and Jessica, the second photographer, came dressed appropriately and blended in with our crowd perfectly! They came prepared for anything with backup equipment. They got to know our families and wedding party so that when we received our photos, we not only had amazing photos of ourselves, but we also had so many great pictures of these important people in our lives. She helped guide us into semi-posed formals, which all came out so natural-looking. While my husband and I were taking photos on the beach with Siri, she was gushing over the lighting, and my husband made a comment to me about how he could tell she really loves what she does. It is so true, and Siri’s passion for photography is evident in her work. After the wedding, we were obviously anxious to see the photos. Siri kept us happy by first posting on of her favorite shots of my husband and I, and then about a week or so later sharing a blog post that features several photos from throughout the night. We loved to look at that, it kept us satisfied until the online gallery was ready and we received an adorably packaged flash drive in the mail with all our photos on file! We are so happy with our photos, there are such amazing shots from every moment of the wedding – getting ready in the bridal suite, ceremony, cocktail hour, speeches, dances, etc. I love that the pictures are so unique to our wedding too, none of the cliché shots that you see in every wedding album. We are so grateful to Siri for capturing the story of our wedding night in all these photos, and we would hire her again in a second for portraits of our future family! Siri took the most gorgeous photos of our wedding and it was such a pleasure to share our special day with her. She was extremely energetic, professional, accommodating, and delightful. Everyone who has seen our wedding photos has said they are the most beautiful wedding photos they have ever seen and it is all due to Siri's talent. Following our wedding, Siri has been extremely responsive to any question I have asked her. She shared our photos with us very quickly, and it was very easy to download, share, and print our photos using the link she sent us. I strongly recommend Siri to anyone who wants to have beautiful wedding photos!